When these start showing up in an application log, it is a good indicator that a performance issue may be occurring in SQL Server. So far as SQL Server is concerned, it thinks the application dropped or cancelled the request. This is a query timeout occurring on the application server. This indicates that the application server got tired of waiting for a query to respond so it cancels execution of the query. By default, most drivers (JDBC, ADO.NET, ADO) will give up on waiting for a response from SQL Server after 30 seconds. As a result, the DBA may not be aware there is a problem until after the application team reports a problem. By creating an event session, we can capture the occurrence of this happening, as well as some additional information useful in diagnosing the problem. Below is a script that will create a file target for tracking occurrences of this. This will capture some session information as well as the query that encountered the problem. This script only includes user processes. Any rows returned are an indicator of cancelled executions. You can click on the XML column to view the contents. You can apply filtering in this on the client_app_name to avoid activity coming from things not related to applications of interest (i.e. filter out SSMS). If you want to tie this into some sort of alerting mechanism it’ll take some additional work; however, this at least gets you to where you can see errors you otherwise would not have known about until someone complained. Happy debugging! How can SQLGrease help you get to the root cause of your query timeout errors? 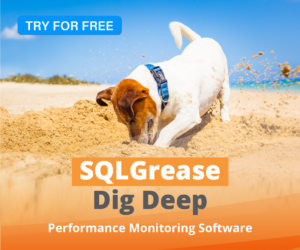 Watch our demo video showing how SQLGrease can get to the root cause of very complex query timeouts. < Previous What are wait events and why are they important for performance analysis? Good article, after reading that i finally figured out why some queries were not showing up in traces/extended events. They were stopped by the app server!